You will be presented with a number of options, which are the pre-packaged versions of Eclipse. 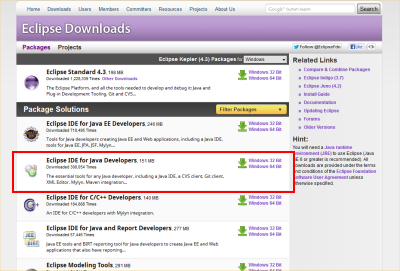 You can add features to any version of Eclipse but I recommend starting with the “Eclipse IDE for Java Developers” version, which is the best feature set for developing with Java. Once Eclipse has downloaded you will need to extract the contents of the archive to somewhere on your hard drive. Beware - some of the eclipse plugin folder names are very long and so extracting the archive to “Program Files” or to your desktop can result in folder names that are too long for the operating system to handle. I recommend creating a folder on your C:\ drive called “Modding” and extracting Eclipse to a folder inside it. Once you have extracted the contents, create a shortcut to eclipse.exe on your desktop or start menu.